George W Bush will serve a second term as President of the United States after Democratic challenger John Kerry acknowledged defeat in the US election. In his victory speech, Mr Bush said he would reach out to Democrat voters and make them believe in him. Senator John Kerry made his concession speech to crowds gathered in Boston. He congratulated the president and spoke of the need to unite the country. What will President Bush's second term mean for America, and the rest of the world? Click here for details, and to watch the programmes. This entire nation has been betrayed by its own citizens, citizens who voted out of fear and faith. George Bush's re-election can only lead to one thing and that is giant leaps backward. It depresses me greatly that the Democrats gave up such a huge opportunity because they were afraid of being labelled liberal. America needs to realise that being a liberal should be a thing of pride not a thing to hide. This is a dark day in American history. Bush could have stated oil as the reason for invading Iraq and the Christian fundamentalists who run this country would still have voted for him simply on the basis of values. There may be 100,00+ dead in Iraq, but at least gay people aren't getting married here at home, right? Well the right man won, that's for certain. Mr Kerry was a worthy opponent and the country is evenly divided. But only one of the two men is committed to the vision that the only long term answer to the powder keg of the Middle East is to clear the scene of tyrants and allow the people there to grow decent, lawful, representative governments. For his courageous stand on "other" people's freedoms, not just that of Americans, President Bush is among our greatest presidents. As an independent voter I feel betrayed and alienated by the Democratic Party. The party has an identity problem. It has failed to build its unique identity and failed to show how it is different from the Republican Party. There is a large divide in the United States. This is a divide between rural and urban, uneducated and educated, sacred and secular. The defining moral issues of the election include that of abortion, illegal aliens and gay marriage (11 states passed amendments banning gay marriage). I can only say that 48% of the United States population voted against the administration and will never stop fighting against them. As John Edwards stated "the fight has just begun". To all you haters: name calling is not going to change a thing. I am not ignorant or stupid. I did not vote out of fear. I voted for the man who will not only protect our country, but yours as well. Regarding this irrational speak of "propaganda". The only propaganda I saw was for Kerry, and thankfully it didn't work. And for all you anti-American Americans: leave. Leave with Michael Moore and most of Hollywood. Why did you think your fame would alter how we feel? You are actors. Most of you haven't even finished high-school. Give me a break. For all you anti-American Europeans: quit your whining. We will be big enough when the time comes to save you. And one more thing: this was our election, not yours. We have been heard. I'm sorry if you don't like it. I don't get it - everyone "claims" to be disenchanted with the USA, yet we everyone wants to live here. So, put that in your pipes and smoke it, Europe! We support our great President and his decisions. All of you Islamic extremists out there can be sure of one thing, we are coming after you. Studies show Americans are growing increasingly fatter in the midsection. Strangely enough, the midsection of America has been hardest hit, with a large percentage of that population gaining weight in the brain as well, dangerously blocking synapses responsible for thought processes with fatty tissue - resulting in brain damage and delusions of grandeur that Bush is going to lead the country down a shining path of glory in the next four years. This is a truly awful result for the world as we face four more years of a rogue superpower in the world. Before you shake an American by the hand, ask him how he voted. When I was researching the candidates before deciding for whom to vote, I asked many supporters of Bush and Kerry the following question: "Name the top ten accomplishments of your candidate". 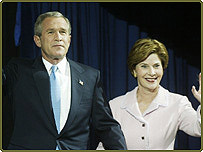 Bush supporters named three to five. Kerry supporter could cite no more than one, and most could cite none. But Kerry supporters were quick to list all the wrongs perpetrated by Bush, and how stupid he is. That said a lot to me about what this election was truly about. The pathological hatred of Bush and the resultant aberrant behaviour reminds me of the Reagan re-election and the ensuing global thermo-nuclear war that the left absolutely assured us would be the inevitable outcome. Then, as now, unreasoned and mis-founded hate has no lasting power in a democracy. As a senior in high school, I am too young to vote but this election has really meant something to me. I am disappointed in America. We have gone through hell with this tyranny from the Bush Administration. It frustrates me that no one, especially the youth, don't take the time to educate themselves. I am very proud to be a supporter of John Kerry, and am so proud of him for running in a time like this. The parable of the prodigal son had a happy ending. But there is a sequel to the parable. We do not know how the sequel ends, we are still living through it. In the parable, the remorseful prodigal son returns to his father's house. The father has a coat put on his back, a ring put on his hand, and has the fatted calf killed. In the sequel, the prodigal son is also given the national treasury, dominion over the land and dominion over the military. In the sequel, the prodigal son turns his back on loose living, but his spending habits do not change. He spends the national treasury. He spends the land, air and water. He spends the military people and material. Since he has turned his back on loose living, his father's house loves for him to spend. As an ardent Kerry supporter and lifelong Democrat, I am quite devastated by the results of the re-election of President Bush. I believe that he and his administration represent the worst in American ideals and policies. Unfortunately, I am now in the minority party and fear that the Republicans will move ever farther "right" in their domestic and international policies. I hope that ordinary people in other countries will recognize that close to half of America's citizen's are against the leadership that we must now endure for another four years. As an American I am heartbroken and disappointed. As an educator I am fearful of how this administration will continue to create a class of children that are left behind because of NCLB. I had hoped that my fellow citizens would analyse Bush's record and see him for what he is. Obviously I was wrong and it was easier for voters to go for the man that jeopardizes our safety daily without any admission of guilt or wrongdoing. Congratulations, President Bush! I did not support you, but America has spoken. However, please remember that not everybody voted for you. Try to incorporate divergent views and consult others. Be mindful of the consequences of unilateral action. We love America, but going it alone is not always the best. What's really saddening from the result of this election, and the exit polls about voters motives is how much fundamentalist religion influenced this vote. The USA now stands right alongside those Islamic fundamentalist nations many of whom it regards as "evil". I am relieved to live in a country where democratic secular values are not smothered by religious dogma. Progressives and moderates in the US lost last night. Fine. We don't have to quit and wait four years to fight again, however. If we do, we will lose again and again. The next four years are far too important to sit back and nurse our collective wounds. Instead of uniting behind the President like we did last time, which really ended up hurting us "big time", we need to challenge his policies every step of the way. We need to minimize the damage he will inflict and prepare the ground work now for defeating his successor. What are you liberals waiting for. We discussed the American presidential election in three special editions of our global phone-in programme Talking Point. Robin Lustig hosted a special pre-election edition of Talking Point from Washington with Eleanor Clift of Newsweek Magazine. As the election results came in, we heard reaction from around the world.